AZ-SCOTTSDALE, Work days are M-F some Saturday. 8-5pm, some design a plus, construction knowledge a must. Responsible are to got out on field to measure and bid out kitchen, bathroom, and/or add, full remodels. Follow up with clients, manage projects from start to finish. On October 6, 2018 I wrote a post entitled "What's Life Like as a Piano Player in a Bar," and I based it on my 35 years of friendship with the two men behind Mykonos' world renown Montparnasse Piano Bar. 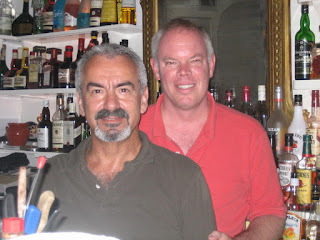 What prompted me to write that piece was that I'd been inspired by their establishment, employees, and patrons to base much of my new Andreas Kaldis novel "The Mykonos Mob," in a gender bending Mykonos bar, and to feature Toni, an American ex-pat female piano player by night who's a sort of private detective by day. I just love her. I opened that October blog with this sentence. "Mykonos’ legendary Montparnasse Piano Bar closed for the season Friday night, giving all of its fans the chance to say adieu to its proprietors, Jody Duncan and Nikos Hristodulakis." To me, the Piano Bar has always represented the Mykonos so many of us remember and treasure. Locals, tourists, old timers, newbie visitors, gay, straight, folks from all around the world carry fond memories of this as a place of welcome and camaraderie, filled with Broadway and West End quality performers and---yes I'll use that phrase--where everyone knows their name. Many tales of the Piano Bar have served as posts here, but they are but a few of the multitude that circulate among it's fans. I chose to base much of my new book in the Piano Bar, because I--and many--saw it as a comforting bulwark against rampant changes overrunning so much of the island. Nikos and I are writing this post with heavy hearts, dear friends. 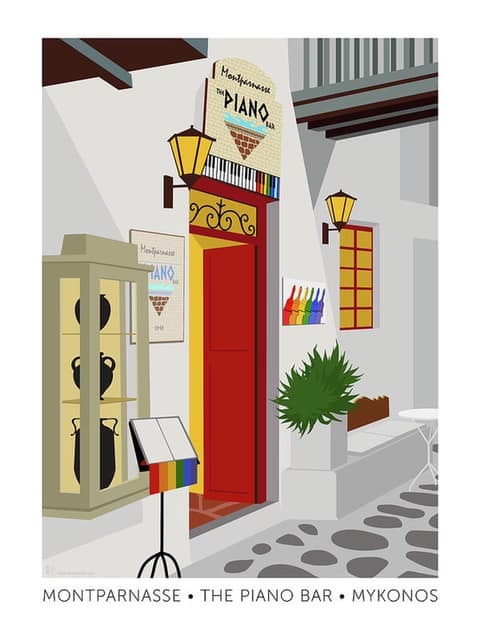 After thirty-six seasons on Mykonos, our times of magic and music and making wonderful memories each night at The Piano Bar have come to an end. We have not come to this decision lightly, or easily, and we want everyone to know that while we knew that our time in Mykonos would end at some point, that day always seemed somewhere off in the distance, just over the horizon." They went on to explain some of what prompted their decision to close, all understandable, but still devastating to a community that had come to regard the Piano Bar a place of sanctuary from the island's ever intensifying summer madness. That announcement precipitated thousands of comments expressing shock and disbelief, touching tributes, a flood of photos and film clips, and reminiscences of how the Piano Bar had served as a stalwart benchmark in the lives of many. It's been a week of heartfelt love and regret over the loss of an irreplaceable island institution. Barbara and I send you much love, Jody and Niko, and we wish you Godspeed in whatever you choose do next, We shall miss you. The entire Island shall miss you. Established small, friendly, private practice in beautiful North Scottsdale is looking for an experienced Optometric/ Ophthalmic technician. Professional, adaptable, easy going, and good customer service is a must. No recruiters please. **Overview** Responsible for all grilled, broiled, fried and sautéed items prepared in the kitchen. Preparation and portioning of food items prior to cooking, such as tempura items, sauces, and grilled items. Other duties include plating and garnishing cooked items. Responsible for maintaining a sanitary kitchen workstation. **Responsibilities** In accordance with RA Sushi’s service and cooking procedures: · Prepares or directs preparations of all recipes in compliance with portions sizes, quality standards, department rules, policies and procedures in the RA Kitchen Guide and RA Employee Handbook. · Prepares an extensive variety of cold and hot food items utilizing standardized recipes. · Prepares specially requested items. · Plan food production to coordinate with meal serving hours so that excellence, quality, temperature, and appearance of food is preserved. · Selects/utilizes knives, hand tools, utensils and equipment to portion, cut, slice, broil, roast, carve, skewer, garnish, maintain holding temperature, grill or otherwise produce food on the kitchen line. · Comply with established sanitation standards, personal hygiene, and health standards, observe proper food preparation and handling techniques as outlined in the RA Kitchen Guide and RA Employee Handbook. · Keeps Head Kitchen Chef informed of inventories. · Report necessary equipment repair and maintenance to supervisor. · Brings to the attention of the Head Kitchen Chef any unsanitary equipment, storage/work areas and/or products. · Communicates with Lead Line Cook to facilitate customer orders efficiently and within required ticket times. · Follows all federal, state, and local laws, codes and regulations outlined by the General Manager and the RA Employee Handbook. · Keep work area neat, organized and clean at all times; clean and maintain equipment used in food preparation. · Performs other duties as assigned by a supervisor. **Qualifications** **Experience and Education:** · Experience in the restaurant industry is a plus. · Bilingual preferred. · A high school diploma or equivalent preferred. · Must be 18 years of age.